Optoma gave TechRadar a demo of one of its pre-production 3D projectors at CEDIA today, and told us that we should see 3D-Ready projectors in the marketplace this year. 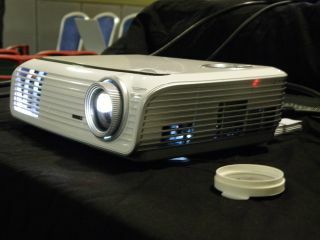 The demonstration was of the company's 720p HD65 projector, and included the use of some prototype shutter glasses. The projector had been given a firmware update to handle 120Hz 3D projection and the results were certainly impressive. "Projectors have a distinct advantage when it comes to 3D," explained Justin Halls, Senior Product Manager for Home Cinema at Optoma. "3D works best with large screens – the bigger the screen, the more immersive the experience." When we asked Hall about availability for the projectors, he told us "you will see the 3D-Ready version of the HD65 before the end of the year." And what will it be called? Most likely Optoma is going to opt for the simple but effective moniker HD65 3D. Usually with 3D technology, price is at a premium but Halls explained that this won't be the case with Optoma's range of 3D-Ready projectors. "Currently the HD65 is selling for £549 and that will be the price of the 3D-Ready version. All we have to do is upgrade the firmware, so consumers will get the best of both worlds out of their Optoma projectors for no added cost." Well, technically there is a cost, and that will be for the glasses. Although there is no fixed pricing on these, they should be available before the year is up for around £70 a pair. Halls also revealed that Optoma hopes to make its whole range of projectors 3D-Ready in the near future. Although it is unlikely that 3D movies will be forthcoming anytime soon, Optoma is hoping that 3D gaming will fill the gap, with the likes of Nvidia already releasing 3D-Ready graphics systems.